Great place, good people and close to the metro what makes travelling easy! I loved it outhere!! I just loved my stay in this hostel. Located in a nice and save neighborhood. Staff is absolutely amazing! Rooms are clean, beds are so comfortable. I didn't want to leave this place! Could stay here forever and would recommend this place to everybody going to Sao Paulo! 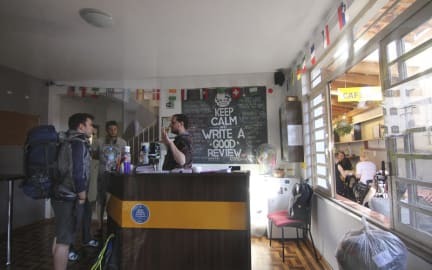 I had an amazing time at the café hostel and would have stayed longer if I had more time. The staff is lovely. Great location (nice neighborhood, nightlife close by) and cosy hostel so perfect for solo travellers. Definitely go back there if I'd go back to Sao Paulo. Café hostel is a relaxt hostel to stay! The rooms are clean and the beds are okay. The breakfast is not included but definitely recommended! I enjoyed my stay at the hostel and in Sao Paulo! Nice building located near to metro station but a bit far from man bar area VM. Helpfull staff and good breackfast available for a good price. Number lock on the dornroomdoor are very secure but not handy at all.